Heliocare Reviews - Is it a Scam or Legit? 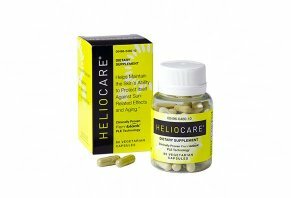 Formulated with Polypodium leucotomos fern, a plant that’s native to Central and South America, Heliocare is a dietary supplement that promises to help maintain skin’s health by protecting it against the aging effects of free radicals, boost resilience, and promote a more youthful appearance. According to the website, their Fernblock® extract has been tested by leading American and international dermatologists, recommended by them for more than 20 years, and is clinically proven. All you have to do is take one vegan, gluten and artificial dye-free capsule per day, and the manufacturer advertises that it will start working to defend your skin. But, is this what you can realistically expect once you’ve handed over your money for Heliocare? What does the available clinical evidence indicate? Are there competitors you should consider? We'll discuss all of these essential factors in this article. What’s the Relationship to Sun Exposure and Aged Skin? The top causes of this condition, he continues, are UV radiation from the sun, which result in collagen loss (the main structural protein in skin), thereby resulting in an aged appearance, wrinkled skin, and age spots. In other words, these chemicals ‘neutralize’ free radicals, which are the harmful substances produced as a result of oxidation caused by UV exposure. Common foods that are high in antioxidants include grapes, blueberries, red berries; nuts like Brazil nuts and walnuts, dark green vegetables, sweet potatoes and other orange vegetables, tea, whole grains, and beans, to name just a few. Will you find any of these ingredients in Heliocare? According to Heliocare’s supplement facts label, the standard version of the supplement contains only one ingredient: 240 mg of Fernblock Polypodium leucotomos (Calaguala) extract (leaf). Comparatively, the Ultra formulation doubles the Polypodium leucotomos extract to 480 mg, and also adds 50 mg of Pomegranate Punica Granatum extract, 30 mg of vitamin C, along with hydroxypropylmethylcellulose and magnesium stearate . Bottom line: Sites like WebMD, the Natural Medicines Database, and Examine.com indicate there’s insufficient clinical evidence that Polypodium leucotomos supplementation can provide benefits in humans. A 2017 study involving 22 participants showing that Polypodium leucotomos resulted in decreased erythematous response (skin redness caused by blood vessel dilation) after UV exposure. A 2015 review of PubMed studies, which found the ingredient was well tolerated with no adverse side effects. A 2015 article explaining the overall clinical evidence related to that Polypodium leucotomos. A 2014 review of existing literature. However, these same sites indicate that internally supplemented or topically applied vitamin C (another antioxidant) could help prevent the formation of wrinkles and other signs of aging caused by UV exposure. Could the Polypodium Leucotomos in Heliocare Cause Side Effects? WebMD and the Natural Medicines Database report that Polypodium leucotomos (not necessarily in Heliocare) has been used safely when taken internally and applied to the skin for up to five months, although the long-term safety is unknown. In some instances (no dosages or other specifics provided), it might cause an upset stomach. How Much Does Heliocare Cost & Where Can You Buy? To help potentially offset some of these costs, the manufacturer offered a $3 off coupon on their website at the time of our research. While each retailer will also have their own refund policies, the company offers a 30-day money-back guarantee on all Heliocare purchases, less S&H. To request one, you’ll need to reach out to customer support at 866-668-7482 or via the contact form on their website. What Can We Learn From Heliocare Customer Reviews? Considering the fact that Heliocare has been around for years, as well as that it’s sold through a variety of national retailers, we encountered quite a bit of online customer feedback for the supplement during our research. For example, more than 320 Amazon customers had given Heliocare an average rating of 4.5 stars, with common compliments referencing increased protection against sunburn, improved skin condition, and reduced side effects related to PMLE (polymorphous light eruption). The relatively few complaints often revolved around no results. We found much of the same feedback and overall average ratings across other sites like Walgreens and LovelySkin. From a company perspective, Ferndale Healthcare Inc. was incorporated in 2010 as part of the Ferndale Pharma Group, Inc., and also manufactures other dietary supplements like OC8, DerMend, and RectiCare. Our brief online search revealed a handful of other sun supplements claiming to provide many of the same benefits as Heliocare, and therefore potentially competing for many of the same customers. How do they compare? Given the wide variety of price points and formulations, how can you cut through the marketing hype and make an unbiased, wholly informed decision—before handing over your money? Does all of this bode well for the supplement in question? Heliocare wasn't listed in any of the four warning letters sent recently by the FDA, and the supplement's website didn't explicitly make sunscreen-like claims at the time of our research. Nonetheless, based on what we learned from the TIME article above, no pills can replace a physical sunscreen. So, while Heliocare seems to come from a reputable company, with almost wholly positive online customer feedback and a 30-day satisfaction guarantee, we think you’ll get the most value by speaking with your doctor before placing any orders. My dermatologist recommended Heliocare and Nicotinamide to me. I have had numerous basal and squamous cell skin cancers remove within the past 15 years. So I purchased these two products and have been taking them for almost a year now. This past week I went back to my dermatologist for my six-month recheck and, for the first time in 10 years, the doctor did not find any new skin cancers! In fact, as soon as she saw me, she remarked on how good my skin looked. She said that she could definitely tell the difference in my skin. The fact that she did not find any new skin cancers is amazing to me because that is the first time in over 10 years that that has happened. I'm amazed by this product and will continue to take it. Highly recommend to anyone that has had multiple skin cancers removed. Write a Review for Heliocare!